This July I’ve been leading a 4-week coding club at the public library for middle school age students. It is a 1.5-hour session for up to 12 students. Kathy, the children’s librarian, is my co-leader. She sets up the library space, takes care of the sign-up list, and prints project resources we use, in addition to supporting the students during the sessions. We worked together during the school year, co-leading Creative Coding Club, which met once a month, and because of its success, we are planning to offer it again this fall. We have this great space at the public library (although the projector doesn’t have the greatest quality display). 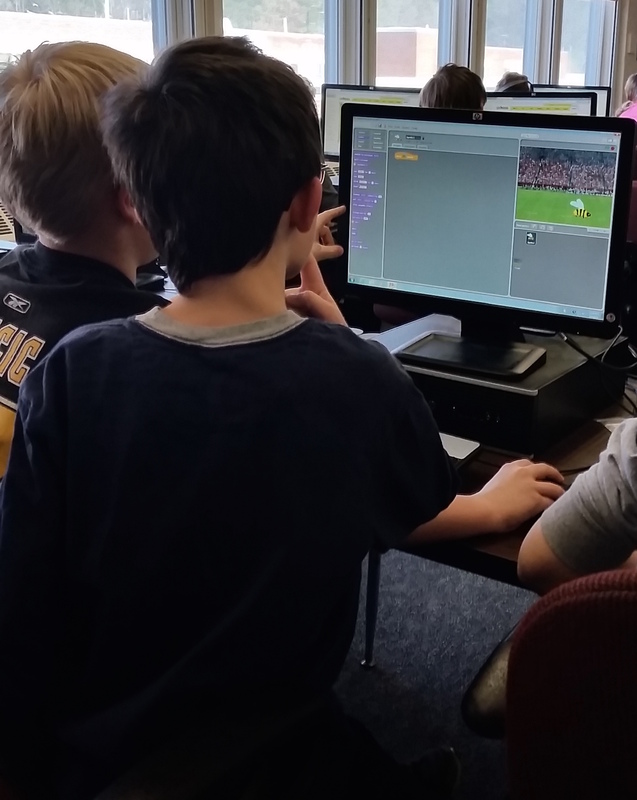 About a week before our first session World Cup soccer was making news headlines which got me thinking about all the sports-themed Scratch projects my students have made. So I went looking and found a Code Club resource with a soccer theme which Kathy printed. (our Creative Coders is a registered Code Club). Kathy also had the Scratch Music cards available as well. I created a class studio Summer #1 and added a remix of the Code Club resources for Beat the Goalie. It has the assets (Sprites and background) ready to add code blocks following the guide. I wanted to add an example of a music project, too, so I made this one and coded up the baseball theme “Charge”. I liked the idea of giving the students two options each week. We have both returning Creative Coders and new-to-Scratch coders (plus a long wait list) for our sessions. To start with two projects of varying complexity will provide students with choice. We hoped this would promote more creativity in their projects. Plus, the session is longer and there could be time to try both. For a first meet up, things went well. There are always technical challenges just getting students on the library Chromebooks and into the Scratch class accounts. It was also a challenge at the end to get them to stop and share their projects with everyone. But overall they were engaged, creative and supportive of each other. The studio filled up with an even mix of music and soccer projects. Since it was a bit chaotic at the end during the time we wanted everyone to check out each other’s projects, I took some time at the beginning of the session #2 to share the projects from session #1. They seem to enjoy seeing their project displayed on the screen (and me struggle to play their game). Along with Chatbot, I introduced the Pen blocks and added a couple of examples from Scratch Started Project resources in the Summer #2 studio – this gave them a second choice of projects, which worked well during session #1. Students are starting to take advantage of the class session studio to look at the examples, remix the resource projects and share their final projects for the group. I finally feel like I am putting some of the features of the Scratch teacher/class account to good use. Both projects were hits with the students. Kathy noted it was exciting to see them working so intently on their projects and then be so proud of what they created! It is why I keep doing this. Coming up! I received a ‘final notice’ email (and saw on Twitter) about Code Club’s Moonhack 2018 project, so I’ve added it as our second option for session #3, although we’ll be coding a few days after the anniversary event. This will be a new project for me, so it should be fun. My 10th after school Code Club started at the end of February. This is a small group of 10 4th grade students, which is nice for a change. It is great to have three girls in the club, too. A couple of the students were in Code Club in 3rd grade and a couple students also come to the monthly Library Code Club. For our first project, I presented an old Code Club project “Felix and Hebert” which I did not find on the Code Club World site when I went to link to it. It is a simple chase game where one Sprite is controlled by the mouse, the other chases after it. The project gets you a simple game with very little coding. It is a nice way to introduce Sprites and Events and I saw some creative projects. For our second meeting, we started with an Etch-a-sketch project with the option to add a maze game to it. Some students stayed with the Etch-a-sketch project, just having fun messing around with drawing on the screen. It was a nice twist to start with the Pen blocks and directional controls, then add the wall color sensing code for a maze game. I feel these two projects transition nicely into each other instead of doing one project or the other. This student just enjoyed making a drawing program. Another student changed the arrow keys commands to generate interesting curve drawings. The up arrow moves the Sprite forward as normal but the left and right keys turn the Sprite. Hold two keys at once for drawing curves. Up arrow for moving forward, Left and right for changing direction. Plus the trail of the chaser bot. It was very cool to see curves drawn instead of the usual straight lines and square corners of the Etch-a-Sketch. Some of the other students wanted to copy this movement style. I was proud to see the students share their code ideas. Later I saw one student sharing a way to make your own code blocks. He thought this code was how he made the Sprite stop moving. When I looked closer, I noticed he didn’t have any blocks under the define hat. He was sharing his code but it wasn’t code that was affecting anything. I am impressed that he choose to design his own code block when he couldn’t find the block he wanted, even if he doesn’t yet understand how to do that. Next week we are going to try the Chatbot project and I’ll have to explain how the “Make your own blocks” work. I have been wanting to show students how those work, now I have a good excuse. In this project, you can teleport to the rainbow. Touch yellow to be teleported to the rainbow. Touch black to return. This is a creative and adventurous group. Should be a fun 10 weeks. Last week Code Club was challenging. I gave my coders a difficult project. They did it, but it was probably not the best fit for the group because it has to be precisely followed with a long set up. 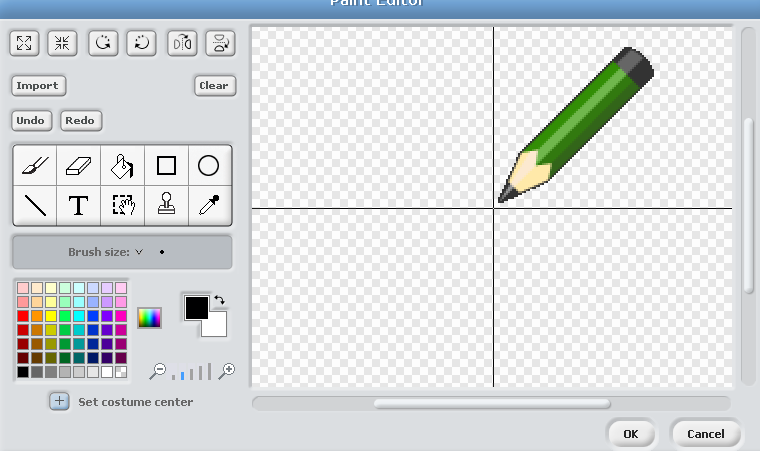 I used Paint Box, a project from Code Club World (We are a registered Code Club World club). 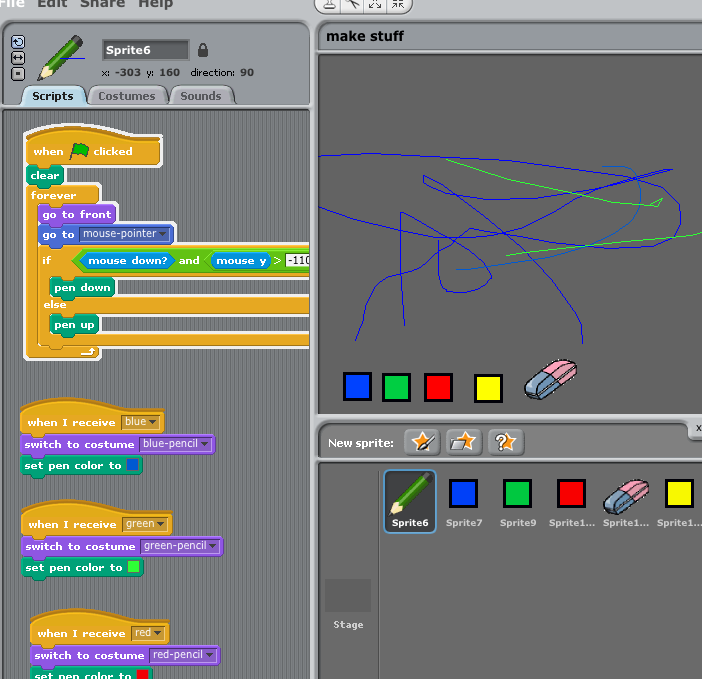 It introduces some key Scratch blocks and new ideas of how to use Scratch. Hopefully some of those ideas will be useful. One of these objectives was to introduce the Pen blocks. It’s one set of tools that I didn’t even talk about in the first round of Code Club. I’m not sure why exactly. Perhaps because they remind me of Turtle Logo programming and for that reason, I couldn’t see how students would use them in a game of their own making. 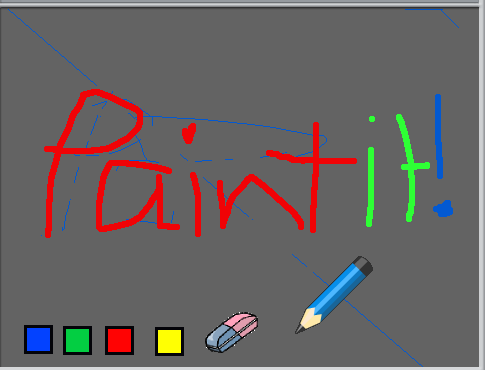 Still, the Paint Box project is pretty cool – you make your own paint program. While Code Club hasn’t used the Pen blocks, I have introduced Simon Haughton’s Etch-a-Sketch project to some 3rd & 4th graders in a half-hour class/group setting. So for Code Club, I went for the more challenging Paint Box project. The second learning objective I found in this project was to see “broadcast” used in another way. I like Paint Box project’s use of the broadcast/receive code blocks. 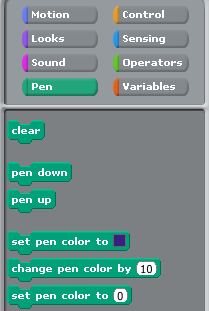 This can be a powerful tool in coding with Scratch. It this case, it is used for simple button handling. We have used broadcast-receive blocks before, but to see it used in a variety of ways will help them see how useful this command can be. There were some unexpected behaviors in the code that the students kept calling glitches. I hadn’t noticed them when I worked through the project. 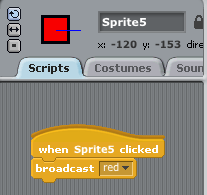 Again, we are still using Scratch 1.4 in the lab, for now, but it turns out what was making the pen “glitchy” was the placement of the Sprite center. This was another learning objective – learn about “set costume center”. The directions specify to set the costume center at the point of the pencil Sprite. If the costume center was over the drawing of the pen itself, the pen down action wouldn’t always work and drawing on the screen became “glitchy”. It seems when costume center on the pencil Sprite combined with the mouse commands causing the Sprite to be under the mouse when “mouse down” is received, Scratch isn’t sure if you are interacting with the Stage or playing the game. If you run the program in projector mode, the glitches are alleviated and the pen works in any costume center placement. I found this out later when working through the buggy behavior with my spouse, the software engineer. So this project was heavy on the learning objectives. By the end of the hour most of them had a couple of buttons. Only one was thinking about adding more – a rainbow pencil or “stamps”. They did it, but their creativity wasn’t tapped. I need to give them time for more creativity. Next two weeks we’ll be back to game projects then they’ll start their independent project. Here are two coders during indoor recess working on an independent project. Yeah, they really can’t wait for the independent project to start. Pair-programming -4th grade style – sharing the same chair. One of them has asked repeatedly if this can be their project for this session and I’ve told him “Yes” each time.